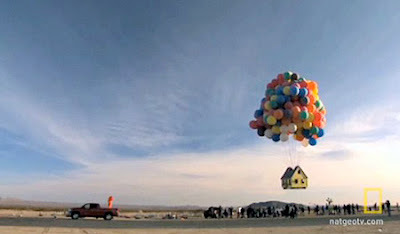 Remember in the movie Up how the old man got his house to fly using balloons? Well, Penn alum Vin Marshall (ENG '00, WQHS) actually accomplished this on the new show he is hosting on the National Geographic Channel called "How Hard Can It Be?" and it premieres this Sunday October 2nd. After the jump watch this AWESOME clip of a "bonafide flying house" from the show and find out what 2 other captivating episodes of his will also be airing this week! What was Vin's path from Penn to doing his own TV show? After graduation he worked as a programmer and then quit the job to be a car mechanic. After a while, he decided to start his own welding business TE Motorworks and also started the website Tango Echo. Vin also just begun writing/blogging for Popular Science. 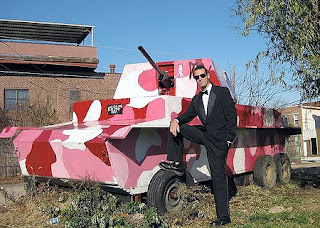 "I'd been building big, weird, sort of giant toys and making videos about them for years. This was mostly while I was living in Fishtown. Last year, I took some of those projects up to the Maker Faire in NYC for PopSci's booth there. I met a number of TV producers while there who were interested in what I'd been up to - one in particular had all but sold this show to Nat Geo, lacking only hosts. I supplied that and a week later we were at Nat Geo's headquarters in DC. This was, by the way, after years of trying and failing, for various reasons, to really make any headway toward a TV show - various sizzle reels, production companies, etc... Ultimately, a show where you attempt to do things like fly a rocket to over 50,000 feet - which required formal approval from all of the branches of the military - seems to be pretty difficult to make. It's over the head of most of the production companies I tried to deal with. So, in short, a lot of hustling and getting nowhere combined with being in the right place at the right time. And stealing the show at the maker faire with a machine that made 30' tall columns of fire didn't hurt either." And it looks like he's not only making a house fly, but showing you his "Homemade Rocket" and "DIY Robo Sub" (see clips below)! "This show is about my buddy Gocke and I taking on incredible challenges - like we used to do in our videos in Philly, but times 100. If this show gets picked up for a season, you'll get to watch us doing this stuff all year long. But we need everyone's support for this to happen - Nat Geo is only going to pick up the show if people watch these episodes and send positive feedback to the network. So help us to help you - because I know you all want to see us try to jump the grand canyon." Come on Penn alumni and undergrads, be sure to watch the show this Sunday and email into the Nat Geo site so Vin can create some more cool shows! Could an average joe send a rocket into space? The How Hard Can It Be? hosts, Vin, Paul and Eric, are about to find out. They've been building crazy machines and fabulous inventions together for years, but now their skills will literally be pushed to the limit. Using everyday materials and knowhow that anyone could acquire they'll attempt to launch a homemade rocket into the atmosphere. Is it possible to build a homemade remote-controlled submersible that can withstand the terrifying pressures found at 12,000 feet down? Vin, Paul and Eric, are three "do it your-selfers" who are going to find out. After a series of intense experiments and a visit to DOER (Deep Ocean Exploration and Research) they head to Hawaii to test their sub. Despite the loss of vital equipment to the ocean depths they get footage of a man-eating tiger shark, and glimpses of deep sea creatures. Speaking of Nat Geo, remember this Penn alum who was featured there as well?